Specs include: All-solid wood with hide glue construction throughout; Brazilian rosewood back and sides originally constructed as a 1953 000-28; highest grade Adirondack spruce top, torrefied with level M1 of Martin’s proprietary Vintage Tone System; Vintage Style 42 appointments including period correct solid abalone pearl rosette ring, top purfling, and snowflake fret markers; grained ivoroid binding with ebony borders at end pin box; aggressively-scalloped 1/4″ Golden Era style bracing with period correct rear-shifted X brace; genuine Big Leaf mahogany neck with full vintage V profile supported by an internal steel T-bar, 1-11/16” width at nut and 2-1/8” at the 12th fret; ebony fingerboard and Golden Era style bridge; bone nut and glued in saddle with 2-1/8” string spacing; open-back Grover tuning machines; period-correct gold foil headstock logo on Brazilian rosewood face plate grained; ivoroid binding; thin high gloss nitrocellulose finish with faux tortoise shell pickguard under the finish. 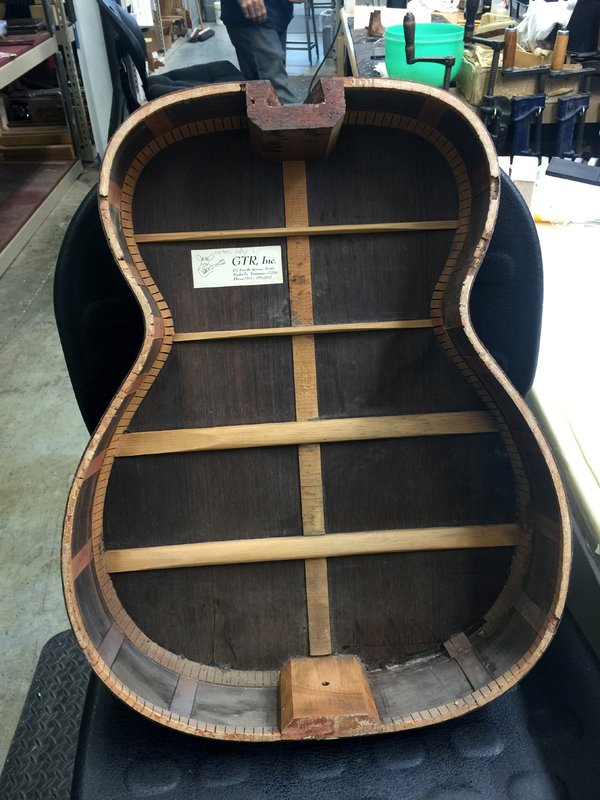 In March of 2015 the Martin Guitar Company received a 1953 000-28 in poor shape, to be refurbished for its present owner. But instead of restoring it to a 000 in Style 28 with the same Sitka spruce and straight bracing used in the 1950s, it was converted into what is essentially a 1939 000-42. In fact, it was the express wish of the owner for the finished guitar to greatly resemble the 000-42 famously played for many years by Eric Clapton, most notably at the 1992 concert televised on MTV Unplugged, which sparked a major upsurge in the popularity of acoustic music, and acoustic guitars in particular. The end result of this conversion is nothing less than spectacular. Even when this guitar is at rest, a silvery luster glimmers from the inlay of solid abalone pearl sliced straight off the shell, as it hugs the level shoulders that spread out from the slender neck. Like tendrils of platinum strewn with flecks of precious stones, it traces the soft, sloping curves down along a svelte feminine waist and out around the ample roundness of a wide lower bout. Solid abalone tends to have subtler pigments spread out among the argent and silvery whites of mother-of-pearl, compared to the commercial Ablam veneers used these days. But they acquired solid abalone for this guitar that is primo stuff. No photograph can capture what happens once this instrument is taken up and tilted this way or that, and the abalone’s phenomenal reflective properties ripple with glinting spectrums of living color, like faceted gems of rosy pink and aquamarine, sapphire blue, emerald green, and ruby red, each dancing in and out of existence as if little flames were magically conjured out of the thin air. Likewise, no written description can do justice to how this guitar lights up the very air with complex, colorful tone the moment the strings are set in motion with a sweeping strum, and the elegant good looks of this beauty are immediately surpassed by its impressive voice and charming personality. Like a conflagration that suddenly ignites and swells in a hearth, the sound of this guitar fills the room with a beautiful radiance that is warm and woody deep down at its heart, yet outwardly vibrant and expressive overall. The lowest notes fire forward with distinct immediacy, triggering a plump undertone that smolders below the bass and makes the solid midrange notes stand out as if suspended over an open abyss. The ringing treble notes sing clearly and precise, yet echoed by a weighty Brazilian rosewood resonance and shimmering harmonic overtones as delightful as a laughing child. For all its richness and complexity, it has an expansive openness that echos a player’s slightest nuance with an airy and reflective reverb, as when a human voice speaks near a dried out old box. 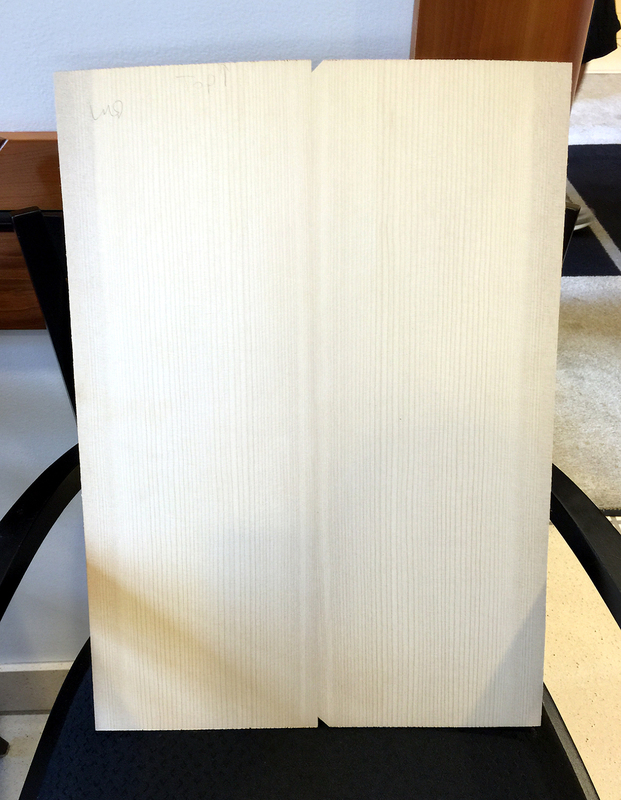 And that’s exactly what the 64-year-old Brazilian rosewood body is, just with a new lid. But what a lid it is! The top-shelf Adirondack spruce provides its fabled definition and headroom, but it has also been torrefied via Martin’s Vintage Tone System. The typical surface tension in the voice of a new Adi soundboard has opened up and given way to tensionless, resonant depth. A fretted note on the high E string left to sustain, melds seamlessly into its own resonance and just keeps going, fading far into the distance of a long, deep torrefied cavern, with virtually no wind resistance to its energized but effortless flight. And that is a quality it shares with few guitars that are not actual vintage Martins. The longer I had it in my hands, the better this guitar sounded, as it led me to how and where it liked to be played for maximum resonance and the least amount of friction. The short-scale neck helps keep things easy and relaxed, while the aggressively scalloped bracing works wonderfully well with the short-scale string tension, which allows slinky vibrato, and full string bends that rival an electric guitar. And the rounded mass of the vintage V-neck shaping keeps the 1-11/16” neck from ever feeling cramped and my fingers from collapsing on top of each other. I found it tremendously enjoyable to play. As the top, back, and sides woke up and slipped into gear I got lost in the sprawling resonance radiating from the torrefied Adirondack spruce top and reflected by the richly delicious Brazilian rosewood. I so did not want to put it back in its case and see it leave with its owner. To put it plainly, I truly wish I could buy this guitar and have it for my very own. Don’t think I didn’t purchase a lottery ticket with this instrument in mind. I have played many Brazilian rosewood conversions, some by the Martin factory, and others by revered retired Martin employees, and other independent craftsmen. This particular guitar is a very successful conversion and a very wonderful Martin guitar. In the 1800s, Style 42 offered the most extravagant aesthetic appointments available from C. F. Martin & Co., with luminous abalone shell inlaid around the edge of the top, the fingerboard extension, and the sound hole, and used for the fancy fret markers of snowflakes and cats eyes. Just after 1900, Style 45 arrived to extend the abalone purfling to all edges of the back and sides, while adding additional inlays to the fretboard and headstock. Martin discontinued all such abalone embellishments during the Second World War. Style 45 was revived in 1968 with the same large hexagon fret markers it had when last seen in 1942. 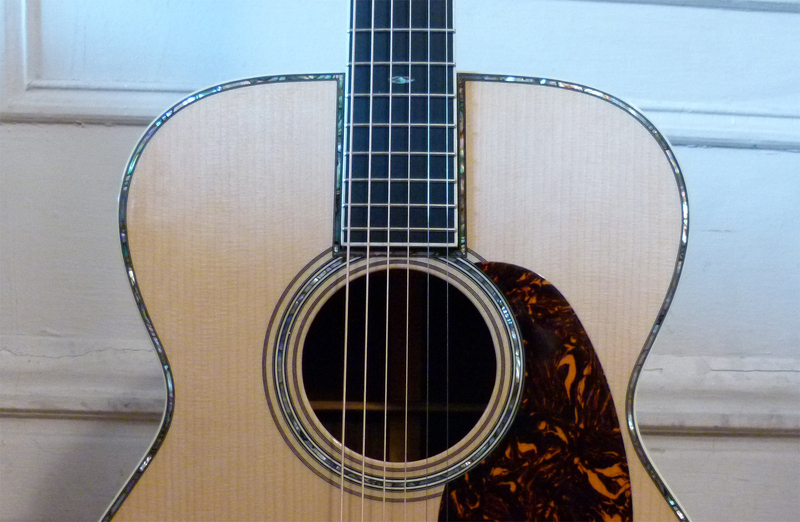 In the 1990s Martin answered the call for the snowflakes of the older D-45 by inventing Modern Style 42, which had the extended snowflake fret markers of Vintage Style 45, but without the abalone on the back and sides, to keep costs down. The actual Style 42 from the pre-war years ended the abalone inlay at the 5th fret with a large, circular snowflake, and the headstock was left blank. When Martin invented their 14-fret guitars in 1929, Style 42 was reserved for guitars with their traditional Standard 12-fret design, except for a few special orders. The 14-fret 000-42 was first offered in the Martin catalog in 1938, with the traditional abbreviated snowflake pattern and the gold foil logo on the headstock that had come into use by that time. They built 112 of them in total, compared to some 132 000-45s and hundreds of 000-28s, making the 14-fret 000-42 both uncommon in numbers and uncommonly cool in appearance. The model has always been a pet favorite of mine and I am happy the Martin factory did such a fine job converting this beat up 000-28 to opulent Vintage Style 42. The 1953 000-28 once belonged to country music star Bobbie Gentry, or so the rumors claim. And at some point it had abalone shell inlaid around the edge of the top. When they removed the top there was a sticker on the inside of the rosewood back saying “Custom inlay by GTR, Inc., 111 Fourth Avenue, North, Nashville, TN.” That implies the embellishments were done by none other than living legend Randy Woods, who is still in Nashville, working wonders with fine fretted instruments to this very day. 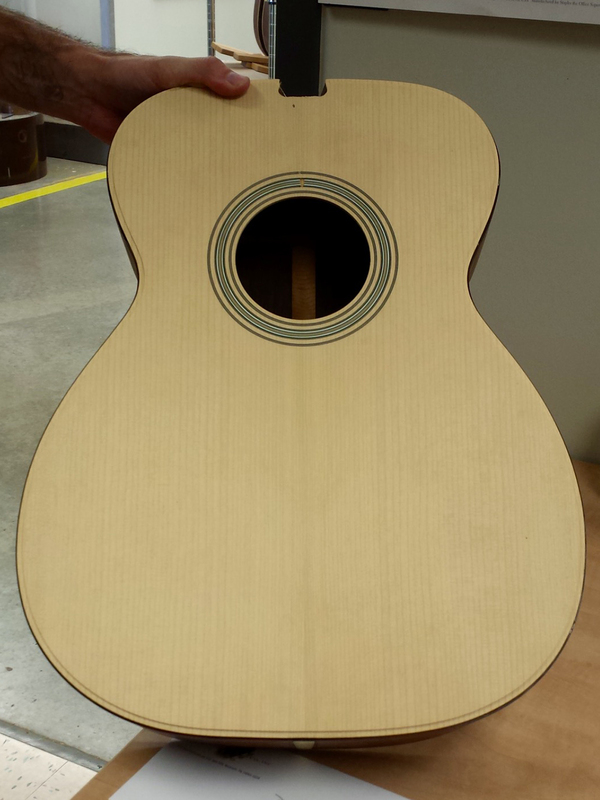 The old Sitka spruce top was beyond salvaging, and so the search began for a new soundboard. The instrument’s owner is well-connected enough within Martin Guitar that he was permitted to pick out his own top. Since he decided to convert the guitar to as close to a 1939 000-42 as possible, only premium grade Adirondack spruce was considered. And after enough lobbying, he was allowed to select from soundboards treated with the M1 level of Martin’s Vintage Tone System of proprietary wood torrefaction. Torrefied wood has been thermo-treated so its cellular interiors resemble and behave like wood that has aged for many decades. In recent years it was discovered that it could be used to alter the voice of a guitar so that it sounds in some ways like a significantly older and much played-in instrument. The M1 level VTS is dialed in to 80 to 100 years of age. Read more about Martin’s VTS and torrefaction HERE. The top was chosen at a time when the M1 level VTS was reserved for Authentic Series instruments or special limited editions, so it wasn’t an option available for Custom Shop orders. Technically, his 000-28 was admitted for surgery through the Repairs Department, and he was ultimately granted an M1 VTS top. And even then he examined so many tops that the Martin representative shepherding him through the process could hardly believe it. But it was clearly worth the effort. Not only does this guitar’s soundboard have less in the way of torrefaction streaks and irregular shading as any I have ever seen, this is one of the best-sounding guitars with torrefied Adirondack spruce I ever played. While a lot of that is due to a particularly great-sounding top, with its lavish cross silking and straight grain that gets tightest where the two halves meet, a lot of its gorgeous tonal properties have to do with the 64-year-old back and sides made from much older Brazilian rosewood. I did not attempt to count each slender grain line to guess how long that particular tree grew in the coastal lowlands of Brazil, and there is no way to know how long ago it was felled and cut into logs. But I am awfully glad at least one of its logs made it to C. F. Martin & Co., and didn’t end up as a church pew or elevator paneling. The figuring is typical for Martins from the late 40s and early 50s. The sides are tight grained and bent by hand on a hot iron with a shape that is subtly different than the 000s and OMs made today. There is a sagging bulbous quality to the lower bout, and the subtle curvature of the shoulders makes them look like they spread out from the neck almost flat, so they seem a little wider, even if they aren’t. The back is nicely bookmatched from one half to the other, with primarily straight grain that has assorted lines wavering here as if they are tall, narrow strands of smoke in various shades from black to earthy reds of cinnamon and sienna. And it has those telltale swaths of saw marks from the blade at the old Martin sawmill, which can be seen on many a Martin going back before they were even making 14-fret guitars. And of course it has the intricate back strip of multi-colored wooden marquetry in the “wampum belt” pattern that has been used on 42s and 45s throughout their history. While the smell of the fresh hide glue used to reassemble the guitar is dominant when I put my nose to the sound hole, I can still detect that sweet rosewood oil after all these years, and that spicy black pepper scent unique to Brazilian rosewood. There is nothing else like it, in smell or in many other respects. 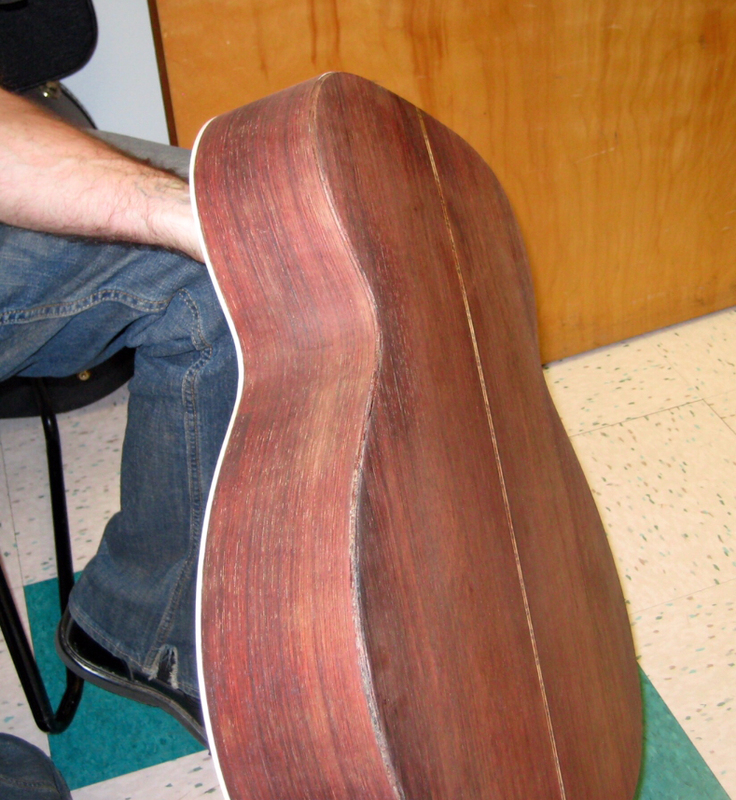 Various other tonewoods can share sonic properties with it, to varying degrees, but nothing sounds exactly the same as a guitar made with Brazilian rosewood. Besides the rosewood body and Vintage Style 42 inlays, there are a variety of features to this guitar that make it like a vintage Martin in other ways. One that may go unnoticed is the ebony shims included in the inlay of the end piece. Just above and below the decorative “box” of grained ivoroid are minute slivers of black ebony. The owner espied that feature on an actual 1939 000-42. It took some persuading, but ultimately Martin agreed to include that stylish, little feature. The shape of the solid-mahogany neck feels very similar to a Martin from the late 1930s. I had original speculated here that the neck might have been hand carved to be more like a 1930s neck than used on their Golden Era/Marquis vintage reissue guitars. I have since confirmed via Martin’s repair department this is in fact the case. This guitar was shaped to replicate the neck on the 1939 000-42 currently owned by the Martin Museum. I like how the shape makes the relatively narrow 1-11/16” neck with 2-1/8” string spacing feel far less skinny than modern Martin necks with those measurements, regardless of their profile shape. And it never stabbed into the sensitive parts of my aging fretting hand as do the 1-11/16” V necks from Martin’s Vintage Series. It does get a bit fat in the hand near the 12th fret, just like a late ‘30s Martin, but I never had an issue thumb-fretting the bass strings or barring bunched-up Jazz chords. As for the high-gloss nitrocellulose finish, it has the same extra-thinness as that used on their Authentic Series, and the faux tortoise shell pickguard is under the finish, in the traditional vintage Martin manner. But the way they adhere them to the spruce top is different these days, so there should be no issue with the traditional pickguard crack that sometimes afflicts old guitars. 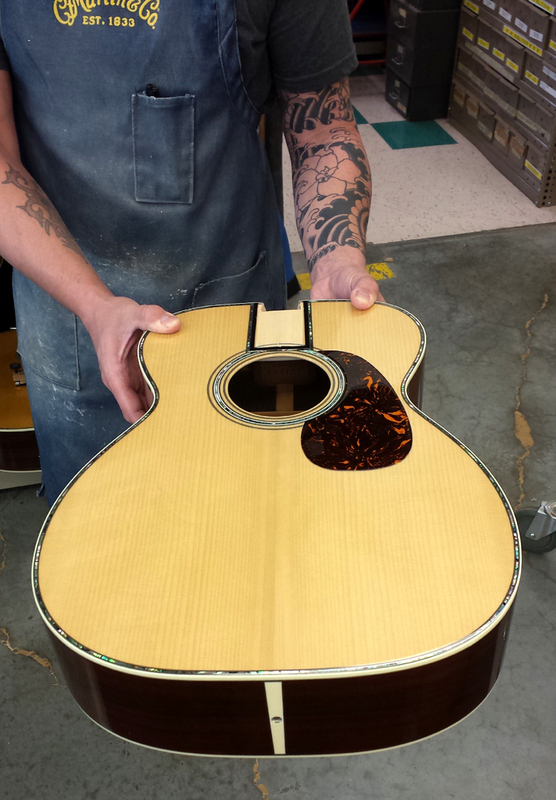 The top is supported by Adirondack spruce tone bars that qualify as Martin’s Golden Era style bracing. More wood is carved way from the main X brace, compared to the scalloping used for the Standard Series, Vintage Series, and many special and limited editions, as it is on the braces slanting across the lower bout, and the smaller tone bars as well. The owner knew that 1939 Martins were “aggressively scalloped” so he continued to stress that to the craftspeople converting his guitar. And whatever the affect that may have had, they did whatever they did very well indeed. The most significant difference between this guitar and a real vintage Martin is the fact this conversion has modern Martin bracing, which does not have the maple bridge plate tucked under the X brace, nor do the tapered brace ends tuck where they intersect with other braces. Tucked bracing is a feature reserved exclusively for the Authentic Series of vintage Martin reproductions, for example the 000-42 Authentic 1939. Comparisons are bound to be made between this one-of-a-kind conversion and the small number of 000-42A 1939s being produced in the Martin custom shop. Given my keen and tireless love of guitar specifications, I am happy to indulge those interested in such details. Items they have in common include an M1 torrefied Adirondack spruce top, a vintage style V neck with T-bar support, the thin finish with the pickguard underneath, a glued-in long saddle, and visual appointments of a 1939 000-42 – just not the same one. I happened to run into the owner of the guitar when we were both visiting the Martin factory in 2015, where he told me of intentions to have a 1939 000-42 created from his beat up 000-28. Breaking with my usual protocol about never revealing information before a model is released, I discretely informed him that an Authentic Series version was scheduled to appear the following January, based on a 000-42 with unusual fret markers, once owned by Kenny Sultan. Eric Clapton devotee that he is, the 000-28’s owner was determined to proceed with his plans to recreate Clapton’s 000-42. 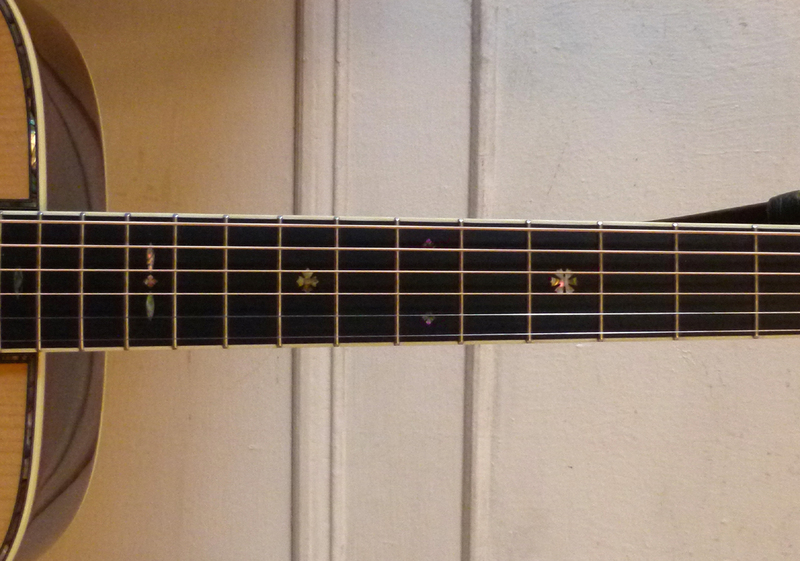 And so the fret markers on the conversion guitar are typical of Vintage Style 42 and most vintage 000-42s. The Authentic model has an abnormal array of markers. The large round snowflake traditionally at the 5th fret has been replaced by the frilly diamond usually seen at the 9th fret, and in its stead is an obscure symbol seen on a few Martins from the early 1900s, and on at least two 1939 000-42s. The tuning machines on the conversion guitar are open-back Grovers often used on reissues of vintage guitars, while the Authentic features a unique closed back tuner in an Art Deco styling. It was on the market for only about one year in the late ‘30s and had to be reproduced via special commission for the Authentic Series model. It has been too long since I played one of the 000-42A 1939s to directly compare the feel of the neck. But I do know they both have a rounded, cheeky neck much like the late 30’s Martins. I would not be shocked if they were carved by the same hands. As a matter of fact, this former 1953 000-28 was brought to the Martin factory for refurbishment when the design and production of the Authentic Series model prototypes were getting underway. The owner took possession of the finished conversion less than a month before I reviewed the prototype of the 000-42A 1939. And now that I have finally become equated with his one-off conversion, I am very glad he went through with his plan. It is a unique and uniquely grand and lovely instrument. 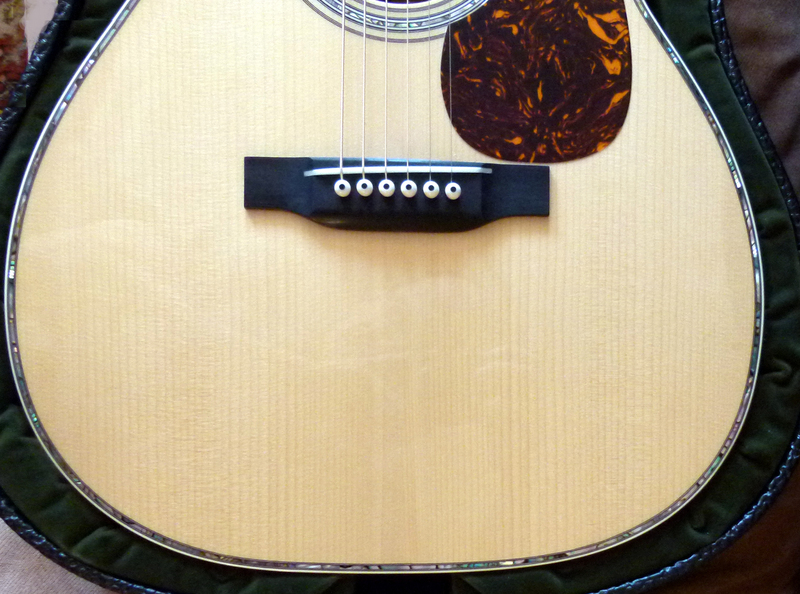 The features that set the converted 000 apart, in terms of being like an actual vintage Martin, include the use of solid abalone shell for the inlays (only 45s get solid pearl in the Authentic line,) the specific outline to the shape of the 1953 000-28, and the significant fact it has a back and sides of Brazilian rosewood. Brazilian rosewood was discontinued at Martin in 1969, due to availability issues. I have heard this was in part related to price increases when Brazil gained its independence and ended the practice of exporting un-milled logs. But the wood was also quickly disappearing from its natural habitat, as Brazil’s coastal lowlands were under continual urban and agricultural development. Today it is officially an endangered species that may not be traded internationally, unless it has documentation proving it was culled decades ago. There are a variety of related rosewood species that can be said to resemble Brazilian in visual beauty, and share some of its tonal properties to varying degrees. But none of them are exactly the same. Personally, I love the sound of Madagascar rosewood. I have two Martins made with Brazilian and two with Madagascar, and I am enthralled with all of them. While they have certain facets to their sound that can overlap, typically speaking, Madagascar tends to have most of its complexity shifted to the high harmonics, while its woody bottom end is a bit drier and more direct and defined. It takes a pretty big body to get Madagascar rosewood to start putting out the kind of deep, round rumble typical of most Brazilian rosewood Martins. Up top, the treble notes from Madagascar rosewood are so very musical in their chime. They sound like orchestral bells, or even crystal in the way they can twinkle and tinkle, and sparkle with sunlit color that is quite sweet and delectable. Brazilian rosewood trebles ring like a blacksmith’s hammer striking steel on an anvil. It is a very immediate and authoritative chime, and a bit more solemn in its color, or a bit more savory in its flavor. Part of that is due to the fact the richer Brazilian undertone marries so well with the resonance of the unwound treble strings. 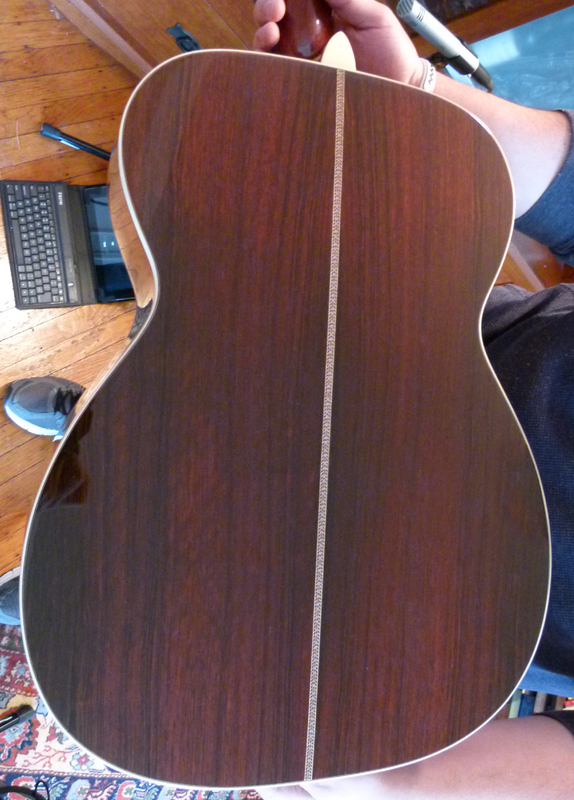 And that is something accentuated by the torrefaction of this particularly awesome Adirondack spruce soundboard. Conversions don’t come cheap, when you include the cost of the initial instrument and the conversion itself. This is especially true of a conversion done by the Martin factory, with pearl inlay and a torrefied premium grade Adirondack spruce top. So, a brand new 000-42 Authentic 1939 is definitely the more-economical option. But if you tried to have this specific guitar built from scratch by C. F. Martin & Co., just the price they charge for a back and sides chosen from their dwindling Brazilian rosewood stash is at least $25,000. Add to that the cost of everything else, and the best street price you would see, after your year-long wait, would exceed twice the street price of the Authentic Series model. And still you would not be getting old Brazilian rosewood with 64 years of playing and seasoning already infused within its venerable soul. This converted 000-28 has my favorite kind of Brazilian/Adirondack tone, warm and richly colored, with a bass that is plump but not woofy, spawning a rich undertone that at times hugs but never smothers the higher registers, and trebles of fine purity that are precise but solid, yet radiating shimmery harmonic overtones. And it comes in a classic short-scale 000 in gorgeous Vintage Style 42, with a voice that does not spread out like a long-scale OM, but has that focused 000 ensemble of notes that stand out from the undertone, together when strummed, and with distinctive identities when flatpicked as a lead guitar. But unlike many modern 000s, when picked slowly, as a succession of individual notes, each string ignites such wondrous sympathetic resonance that swells and wavers, glitters and glows. Did I mention I liked it a lot? Life is good when I get to play a guitar this good. Even if I don’t get to own it.